There are three main methods for printing your labels when shipping through Etsy: one label per sheet, two labels per sheet, and thermal roll labels. We'll break down each method in this guide. Note: If you have difficulty printing your shipping label through your browser's PDF viewer, try downloading the shipping labels or open them in Adobe Reader. Follow our instructions on how to install Adobe Reader if you don't already have it. Etsy shipping labels are made to print on 8.5" x 11" paper. The labels fit perfectly on 4" x 6" labels, so OL1499 is the best fit. Because you're only using one label on the sheet of 2, you can reuse it for future shipments. Keep in mind that reusing label sheets multiple times can sometimes cause them to curl due to heat. The first thing you want to do is change your preferences to print one label per page. To do this, visit Shipping Labels on your shop and select Options. Make sure One label per-page is checked under Download preference. View your shipping label for the intended sale and download the PDF to your computer. Place your Etsy shipping label correctly into your printer and print. You'll follow much of the same steps listed above. Once again, OL1499 is the best sheet size for printing directly on labels. Go to Shipping Labels, Options. For this option, you'll want to select Two labels per-page under Download Preference. Download the PDF generated by Etsy and open in your PDF viewer. Etsy recommends using Dymo LabelWriter 4XL and Zebra GC 420d label printers, however, most 4" x 6" roll printers should work. We offer these rolls in a 1" core and a 3" core. Select Format for 4x6 Label Printers from Download Preference. Download your label and open the PDF. Choose your label printer from the print options screen (or the 4" x 6" option). Now, you're an expert on printing shipping labels from Etsy. Start shipping your packages and let the profits roll in! Want more expert Etsy-selling strategies? 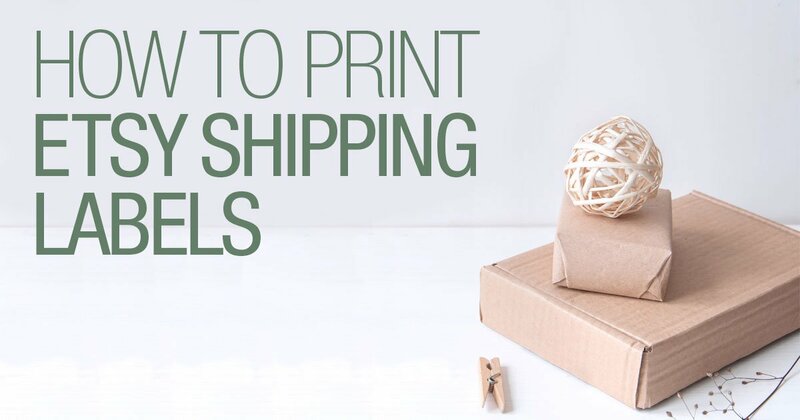 Check out these selling tips from top Etsy sellers or learn how to set up your shipping station for maximum efficiency.